Some called it the end of an era. Within a few weeks in the early months of 1905, two of Duluth’s biggest boosters were dead. The more famous was Jay Cooke, the man who financed Duluth’s first boom in the late 1860s and early 1870s, who died on February 16. The other was a more local figure, a “genial and very optimistic man” and “one of the most consistent believers in the future greatness of this city.” His name was Captain Jeremiah H. Triggs, the namesake of the Kenwood neighborhood’s Triggs Avenue. Triggs was best known as a real estate man. He platted, with various partners, properties from New Duluth to Endion, West End to Kenwood, and made lots of money in the process. Like so many investors of the era, however, he ended his life with little to show for it. Born in Indiana in 1841, Jeremiah Triggs moved as a youth with his farming family to Iowa. By 1862, he’d joined the Iowa Seventh Cavalry—which spent the Civil War participating in Indian Removal across the Plains—and participated in the battles and skirmishes that ensued. He was promoted three times, to Second Lieutenant in 1862, First Lieutenant in 1864, and Captain just before he resigned and mustered out on June 8, 1865. As a member of Company D, he probably participated in the Battle of Julesburg on January 7, 1865, a defeat for the United States. Six months after Julesberg the Iowa Seventh engaged in the Battle of Horse Creek, near Scotts Bluff. In at least one account of the battle, Triggs is mentioned by name. A close read, however, leads to a bit of a mystery. First, the Battle of Horse Creek occurred between June 13-14, 1865—days after Triggs had resigned his post. Second, while it is not entirely clear if Triggs was present for the battle itself, his family (presumably a wife and at least one child) most assuredly was, because historical accounts mention them being moved out of harm’s way along with other officers’ families. A few possibilities present themselves. First, there might have been a clerical error, and the records should read June 18 (rather than June 8) for Triggs’ promotion, resignation and mustering out. This makes some sense, since his superior officer Captain Fouts was killed during the Battle of Horse Creek. On the other hand, perhaps the date is correct, but out in the field, Triggs simply didn’t receive word of his mustering out until after the battle. A third possibility is that the date is correct and he left before the battle—for whatever reason—and abandoned his family. No matter the case, five years later Triggs had a different family. The 29-year-old Captain Triggs had returned to farming life in the Colorado Territory, married himself a sixteen-year-old bride named Lydia, and together they had a one-year-old son. By 1875, Triggs had begun to show his knack for community development and boosterism. He settled for a time in Laramie City, Wyoming, where he wrote the city’s history, city directory, and later a book on the history of Cheyenne and Northern Wyoming. Triggs also started touting himself as a mineralogist and mining expert, and wrote widely distributed guidebooks on mining prospects in the Black Hills. Sometime during this period, he and Lydia—who by then had borne him three sons—were divorced. She moved to Denver to make her way as a dressmaker. Triggs traveled to Kansas, and there in 1880 married Martha Estes, age 24. It is then, sometime between 1880 and 1883, that he reportedly met Jay Cooke in Philadelphia, and Duluth’s first benefactor persuaded him to take his boostering talents to the Zenith City. Immediately upon arriving in Duluth in 1883, Captain Triggs made himself a big personality, unfailingly conscious of keeping up the faith—at least in the press. When other real estate men were frequently quoted expressing their disappointment in the market or claiming sales were “flat,” Triggs instead talked about his last big deal, and how things were looking up. He was heavily involved in the Chamber of Commerce, the Unitarian Church, the Grand Old Army of the Republic (the Civil War Union soldiers’ veterans’ group), and the Masonic Lodge, which wielded a great deal of influence during Duluth’s first 75 years. Triggs was most remembered for his efforts to dam St. Louis Falls on the St. Louis River to create a hydro-electric plant that would power Duluth and the surrounding area with electricity. Newspaper accounts of his frequent business trips East reported with breathless expectation of a boom that always seemed just around the corner. This dam also connects him more tightly to Jay Cooke, who first envisioned the St. Louis as a source of power in the 1860s. In fact, Cooke owned all the property along the St. Louis River upon which the Thomson Dam was later built, and of course the land that is now Jay Cooke State Park. The power plant didn’t materialize during Triggs’—nor Cooke’s—lifetime. But it was close: the Great Northern Power Company Dam—known today as the Thomson Dam—first lit up Duluth in 1906, the year after both men died. 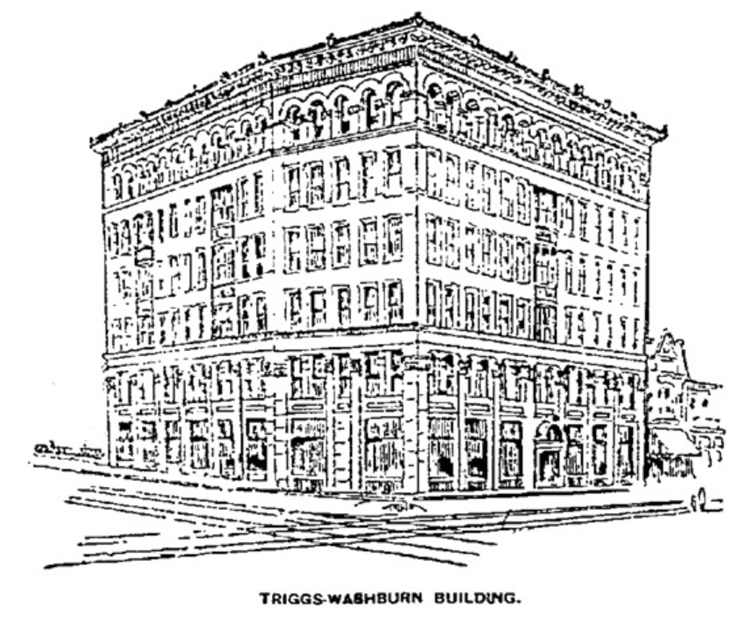 The answer to the Triggs-Washburn Block mystery may lie in the captain’s longtime interest in mining, which drew him to look northward to rumors of gold at Lake of the Woods, about the same time the building was under construction. For a few years, the Triggs Mine at the northern tip of Minnesota was said to be sure to give up her gold any second, but never did—and then things began to fall apart. In 1896, Triggs—likely over-extended in his gold mining investments—defaulted on taxes on various properties. In 1901, both he and Martha were forced into bankruptcy. They moved to the Central Hillside, eventually landing at 19 West Fourth Street. Within weeks of Captain Triggs’ passing at the age of 64 in 1905, Martha abandoned their home to live with friends, and then traveled to Oklahoma where she stayed for many months. In 1910, Martha’s fortunes changed for good. She married—in what the Duluth News Tribune called a “surprise wedding”—mining and banking tycoon Captain Joseph Sellwood. She then became mistress of the Sellwood mansion at 1802 East Superior Street, across the street from two other mansions Sellwood built for his daughters and their husbands. After just four years of marriage, Martha’s multi-millionaire husband was dead, and the Widow Sellwood was embroiled in a months-long fight over her inheritance with his four children. Eventually, all was resolved to Mrs. Sellwood’s satisfaction, and she enjoyed many years of wealth and tropical vacations—and solitude—until her death in Beverly Hills, California, in 1945.